We find ourselves in the "Pretty Room" today. I name coined by my family for the ultra-girly living room in our house. I think most of the rooms are pretty and girly but this one seems to stand out. It could be my use of old doors for backdrops and coffee tables or the lavish use of floral print. 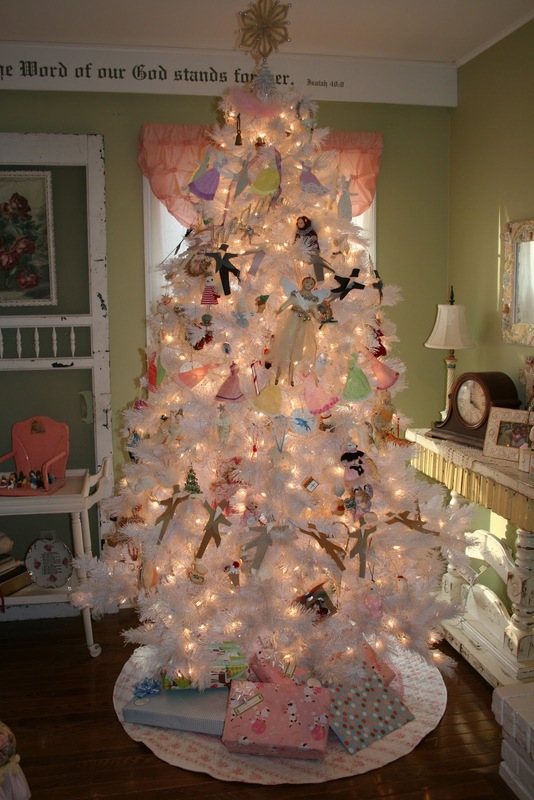 At Christmas what makes it more girly is the white tree. Most of my Christmas decorations can be credited to my Mom who has made me beautiful things through the years. One of my absolute favorite is the paper garlands of dancing men and women. 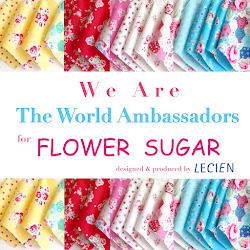 The pattern came from an early Martha Stewart magazine. It was quite the labor of love. I have two strands each of men and women. Two years ago she made me the second batch from velum instead of paper and they are holding up much better. I cherish them both. The mantel is all a-shimmer with garlands and trees. 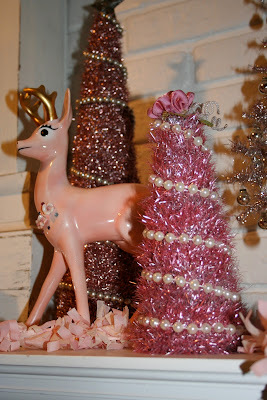 The pink deer is a new find this year and fits perfectly in with the decorations. It may stay there year round. The shelf on the mantel was purchased at the Junk Bonanza in Minnesota three years ago. Two years in a row I made the 18 hour round trip with my friends Diane and Sally. We had such a fun time and I remember those trips each time I look at the shelf. It makes a wonderful display piece for all the little treasures I find. Years ago I made this wreath using my Grandmother's ornaments. I want to publicly thank my friend, Diane, who lovingly fixes it each time I drop and break an ornament. Diane makes and sells vintage ornament wreaths so I can count on her for a repair when needed. Perhaps I should package it a bit more carefully. I have two nativity scenes from my Mom which I switch out each year. One she made in ceramics class and this one is cross-stitched. I just sent away for a pattern I saw on Tina's blog "The Quiet Home". I plan on knitting one and then when each of my children have their own homes, they may take one of their Grandmothers. The wooden puzzle of the three crosses was made by my now college son when he was in shop class in middle school. It makes the perfect backdrop for the nativity and is a reminder of the reason God came to earth and was born in a manger. This chair was found at a barn sale this summer for $35. 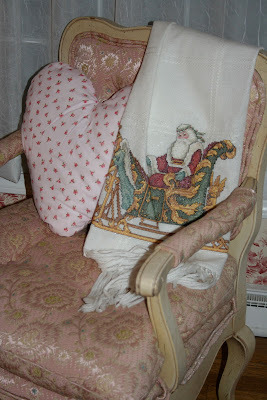 It looks perfect with the heart pillow and the throw my Mom made several years ago. My Mom is always creating something beautiful with her hands and my Dad is artistic as well so I got a double dose of creativeness from them. My last picture today is of the sweet little mouse I found at Ikea a couple of months ago. I have such an affection for mice. When I saw this one, I instantly knew she was coming home with me. A tiny top to a little chair makes the perfect home for her. White trees are so pretty! I would love to see all your decorations in person, they are all so lovely. I wanted to tell you that I got your package and I love it. I can't wait to wear the apron when I do my Christmas baking. Did you paint the spoon? I can't wait to put up our tree on Saturday so I can put it on it. Thanks again! I love all your treasures! I am in absolute awe of your Mother's handi-work on the garland! Just beautiful. 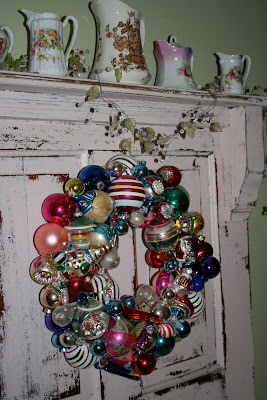 And I love the idea about using cherished ornaments to make a wreath! Love it! I have never seen anything like that paper garland. What an amazing work of love...I can imagine the hours that went into it and I just love that white tree. I just love your blog. I love the colors and all the wonderful things you display in your house. The Martha Stewart ornaments are sweet. I am a dollhouse lover as well. Happy Holidays. I will be back often! ps. Keep an eye on your mail box ... smile!!! I can picture the garland your mom made being handed down through the generations -- it's so beautiful. 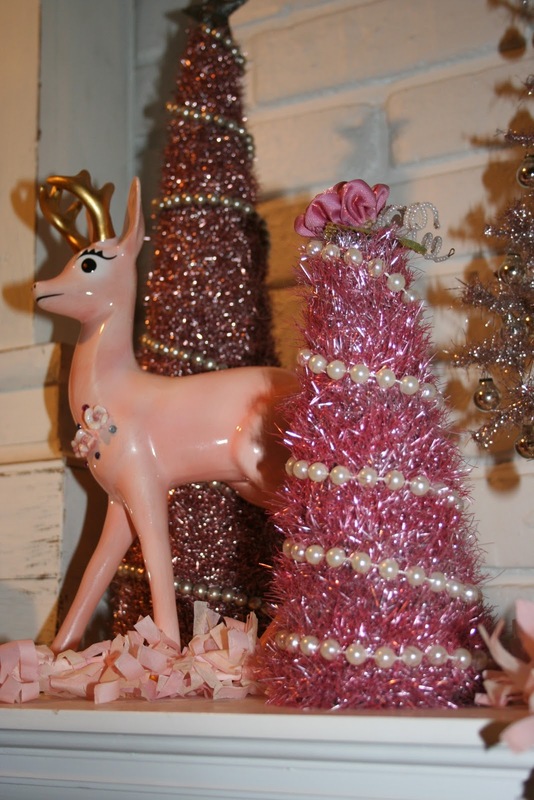 Is the pink deer vintage? I *love* him!! your pretty living room looks lovely, renee. love the white tree and all of your special touches. i especially like that garland your mom made you, sooo sweet. 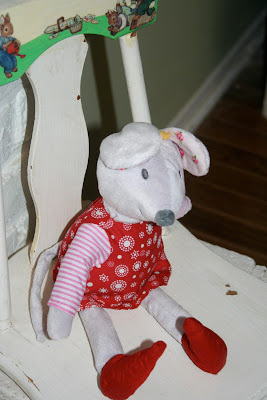 my little rosie has that little mouse from ikea, she calls her 'angelina' after angelina ballerina. she sleeps with her every night. Your mom is so very talented (like you are)! What a labor of love all of her beautiful cross stitched gifts are!! Amazing works of art!!! I love all your sweet decorations. Your tree is so beautiful! Love the ornament wreath too. Everything is so pretty. I love the tree. And everything else. I love your wreath with the Gramma ornaments! And I remember the Martha garland from her magazine. Neither decoration matches my prim style, but I love to see good eye candy! Just beautiful.